Crispy on the outside and soft inside, these delicious Crispy Cheesy Garlic Smashed Potatoes are a perfect side dish for every meal! These POTATOES friends are life changing! I mean I have always loved potatoes in all forms but these are my new favorite! I have been eating them for my lunch and dinner since the last 2 days and today I had similar plans too but I ran out of potatoes (I know how can I?!) and it’s snow everywhere so I am going to dream about these tonight! 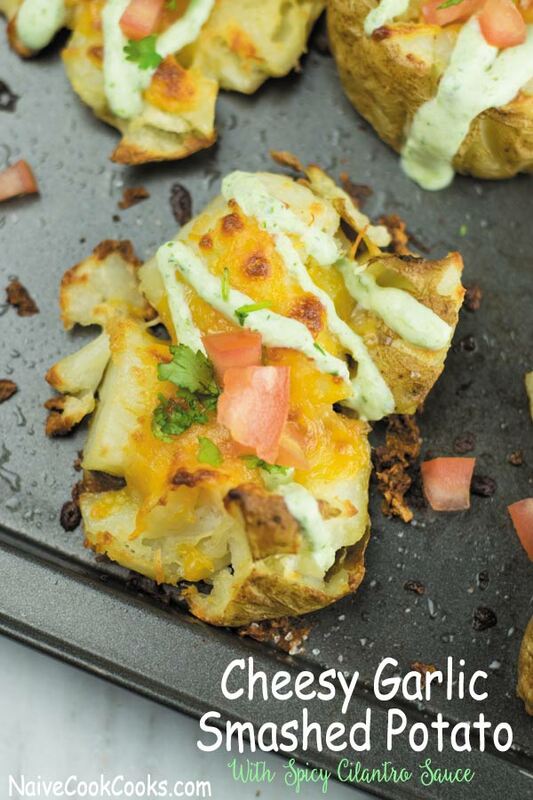 If you haven’t yet experienced the magic of crispy dangerously addicting smashed potatoes, friends you MUST make these! 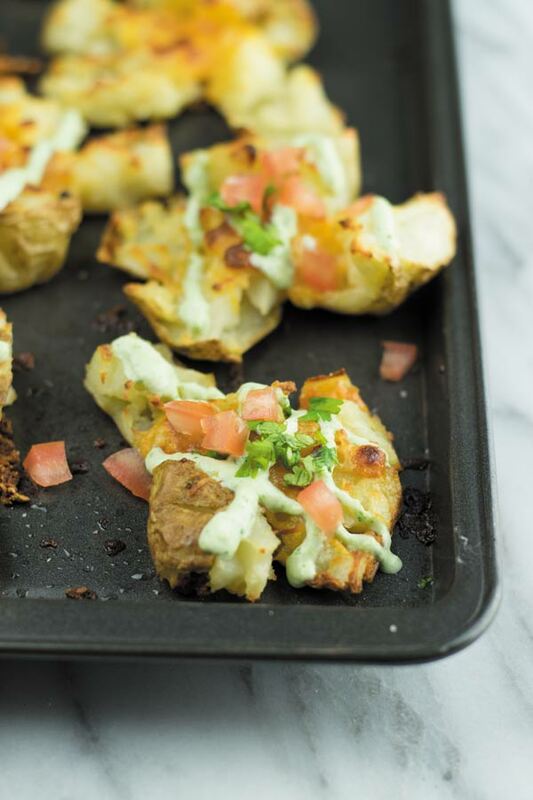 These are lite potato heaven – crispy garlicy crust with cheese, soft perfectly seasoned potato inside and then everything drenched in a spicy cilantro sauce! I served these along with a big salad and Piri Piri Chicken Quesadillas and that was one dinner! If you have been following, you must know that I love food. I dream about my meals and I get excited when I know it’s time to eat and this is one reason I can never understood why some people starve themselves to fit into that dress when there is all this amazing deliciousness! On another note it’s been snowing here all day and I am loving every moment of it! Take potatoes. 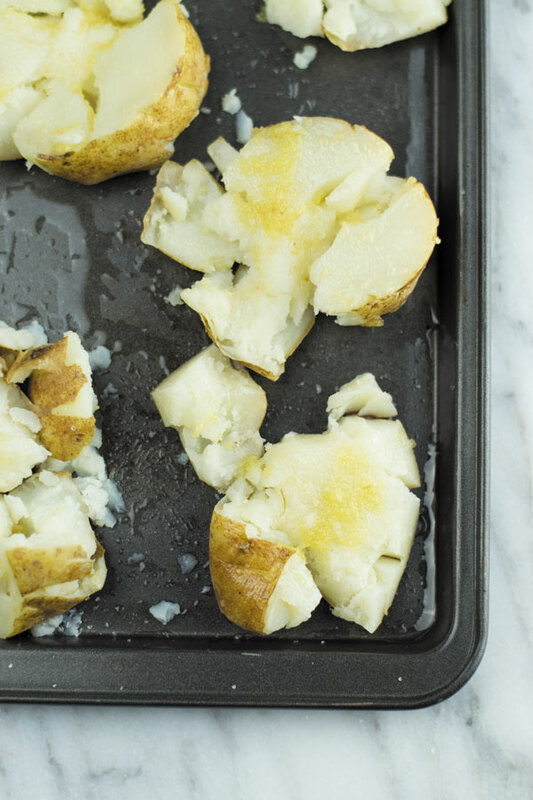 Clean them and using a knife or fork poke holes in the potatoes. Boil potatoes until fork tender. Drizzle a baking sheet generously with olive oil. That’s the key to prevent potatoes from sticking and getting super crisp! Place the boiled potatoes and smash them. 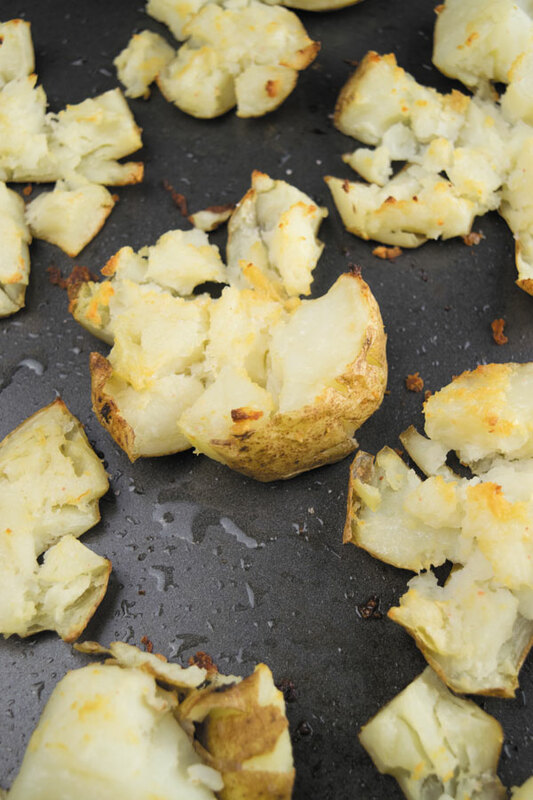 If your potatoes are too big, you can cut them in half and then smash. Season generously with salt and rub garlic oil paste over the potatoes. Bake them in a preheated oven for about 30 minutes. Meanwhile get the sauce going. 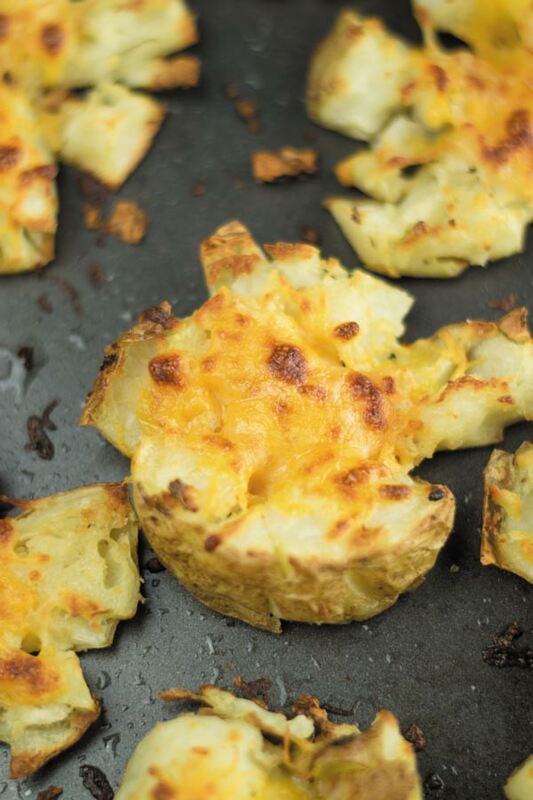 Once potatoes are cooked, sprinkle cheese and place them in oven for another 10 minutes or until cheese is almost melted. Then change oven setting to broil and broil them for 5-7 minutes until cheese is browned and bubbly! Omg I can eat them right now! They taste so good just like this also! But we are fancy so go ahead and drizzle that creamy cilantro sauce and devour! Pre heat oven to 420F. 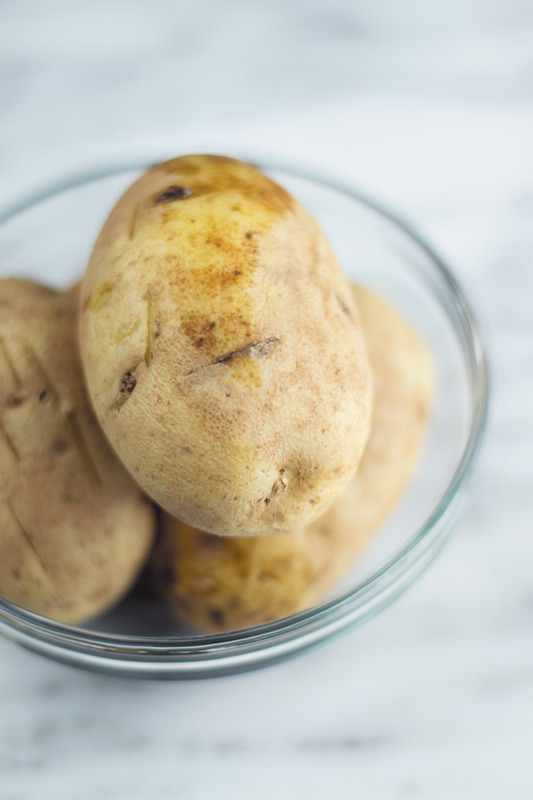 Clean potatoes and poke holes in potatoes using knife or fork. Boil until fork tender. 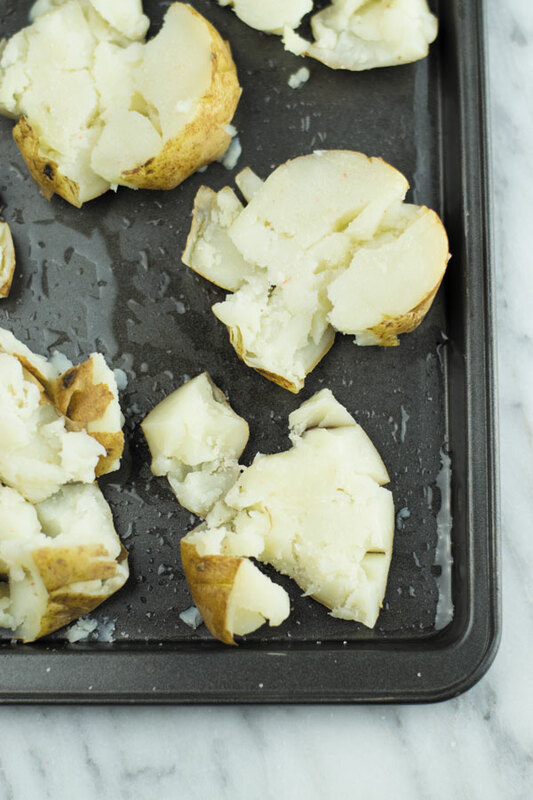 Grease a baking sheet with oil and place boiled potatoes. Smash potatoes and sprinkle generously with salt. In a small bowl mix garlic paste and 4 tbsp olive oil and rub this garlic oil on top of smashed potatoes. Meanwhile place all the ingredient of sauce in a blender and blend until smooth. Taste and adjust as per your taste. 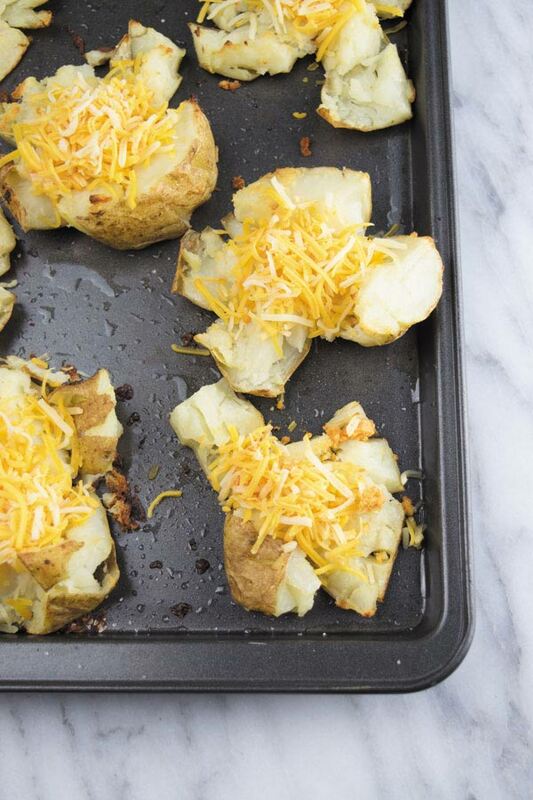 When potatoes are done, sprinkle them with cheese and bake for another 10 minutes. Then increase oven setting to broil and broil them for 5-7 mins until cheese is browned and bubbly. Once ready drizzle with spicy sauce and serve immediately! Great as a side dish with any meal.